"Having one software package that integrates a lot of functions...is a great advantage." 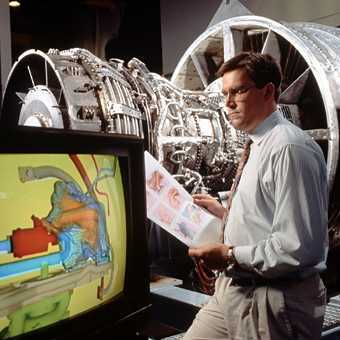 The Turbo Machinery Transfer Laboratory studies fluid dynamics, heat transfer aspects of gas turbine engines, and convective heat transfer. Gas turbines are used throughout the world for highly efficient power production because the fuel-to-electricity efficiencies of today's gas turbines are the highest of any commercially available power source. A gas turbine engine works by compressing air in a rotating centrifugal or axial flow compressor; the air then enters a combustor where it is mixed with fuel and burned. The resulting high pressure and temperature exhaust gases are then expanded through the turbine. Much of the recent progress in increased efficiency is due to the rise of combustor exhaust temperatures: they are currently as high as 2600 F in some high-performance military aircraft engines, and getting higher. 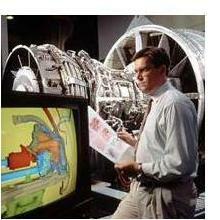 As combustor exhaust temperatures continue to rise, so must the thermal limits of the turbine components. Brian Wiedner's group studies the physical mechanisms responsible for heat transfer from the combusted air to the turbine, to contribute to the effort in developing economical ways to increase the durability of turbines. The equipment Wiedner uses to take air flow measurements must be reliable under many kinds of test conditions, and his data analysis software must be as well.